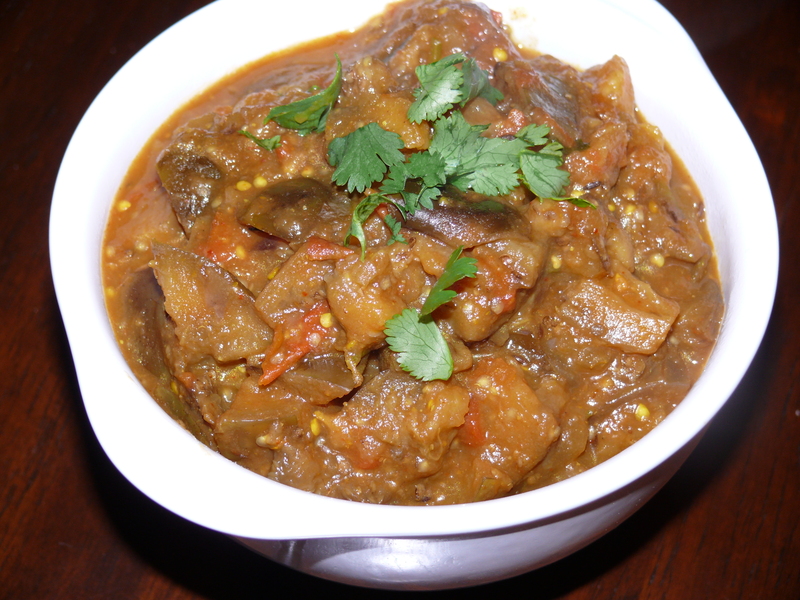 Thought I’d make a Gujarati styel eggplant to go with Gujarati dal the other night and found this recipe for Gujarati eggplant and potatoes on Mysoorean. I decided to skip the potato though. It turned out really nice! Heat oil in a saute pan and throw in the cumin seeds. Once they brown, throw in the eggplant and cook for a few minutes. Add the green chilis, ginger and garlic and cook for another few minutes. Then add the turmeric, chili powder, and coriander powder and cook for another minute or so. Then add the jaggery, tomatoes, and salt and cook until the tomato softens. Add 1 cup of water and cook until the eggplant is totally tender, adding more water if necessary. Once the eggplant is tender and pretty dry, add the lime and cilantro.